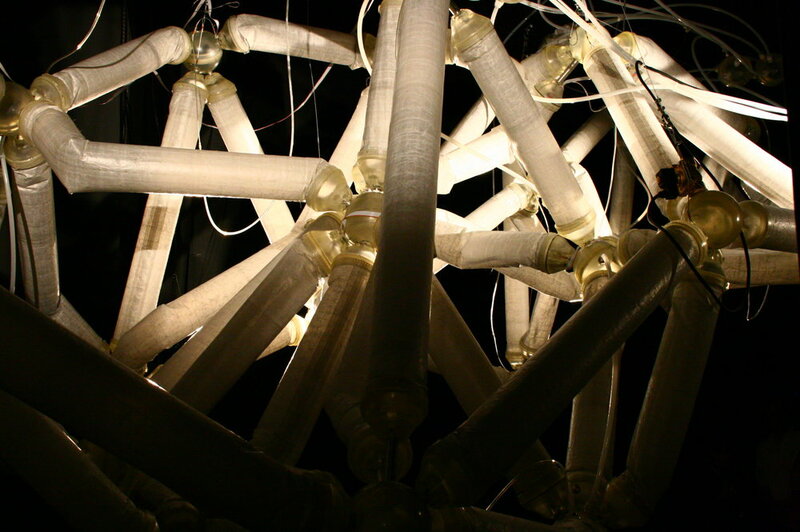 Premiered at the Machines and Souls exhibition in Madrid in 2008, the Inflatable Architectural Body is comprised of a system of plug-and-play, inflatable, musculoskeletal modules which create a series of transformative organic structures influenced by the exhibition space. The modular components can be freely connected and rearranged to produce sculptures of varied size, form, complexity and interactive possibility. In this way, the work is influenced by the nature of the environment, the exhibition space, and by audience participants, who are engaged both physically and aesthetically with the constantly transforming structure. Inflatable Architectural Body uses new technologies to continue a long line of work exploring the forms, movements, and interactions that underlie our experience. As a magnification of the cellular world, Inflatable Architectural Body gives us a direct, visceral experience of the kinds of minute geometric constructions that underlie all of life. As the audience brings the sculpture to life, the piece recalls the notion that none of us are bystanders in the natural world. By separating elements such as these from our normal modes of experience, and reimagining them in new bodies and interactions, we hope to gain a new perspective on ourselves, and the effects we have on the world around us.